On Boxing Day last year, my Asvel bento box died. The sad thing was, it wasn’t totally dead, just that a miniscule knob that held the hinge mechanism of the lock-tight lid broke off and that was the end of the lid. So instead I turned to using this shallow Dualock box from Lock ‘n’ Lock. The shallow shape is ideal for packing bento, as I explained here. At 550ml, it’s relatively close in volume to the 630ml capacity of the Asvel one, and it has a watertight lid. Japanese guidelines state 630ml as about the ideal size box for an adult woman’s meal, hence this is a standard size for many Japanese boxes. That’s true if I have white rice or a noodle dish. However, I’ve found that for a meal with brown rice, I usually can’t finish that amount of food, and instead, this 550ml box provides exactly the right amount for me. I’ve since acquired a brand new Asvel box, but I shall continue using this one a lot more from now on, especially since I have brown rice for most of my meals. Curious what’s for lunch inside the box :)? Brown rice, stir-fried pork (shabu-shabu or sukiyaki cut from the supermarket), with pan-fried brinjal (local aubergine). If your bento aesthetics lean towards zakka (such as FrankTastes), and you are hoping for Shinzi Katoh items to appear in your Christmas stocking this year, you might want to hint to your friends and family with these Singapore Shinzi Katoh shopping tips (^.^). Maameemoo (Orchard Cineleisure, 02-09) is a tiny zakka heaven, with a selection of Shinzi Katoh items, including bento boxes and bags. Short totes (which can double as lunch bags) cost S$39 and there are regular new shipments, according to the sales assistant. I’ve seen a much larger zakka shop at Cathay Building, but can’t remember if they actually had Shinzi Katoh or bento items. Both of these seem well-organised at very similar prices: lunch totes at S$26.90 (The Little Happy Shop) and S$26 (Zakkaart.com), double-tier bento boxes at S$29.90 (The Little Happy Shop) and $$28 (Zakkaart.com), single-tier boxes at S$17.80 (The Little Happy Shop) and S$24 (Zakkaart.com). Don’t forget to factor in the delivery charges (pretty minimal if by standard mail within Singapore). There is also Momo’s World, which seems to be a new online shop, less professionally-organised website than the other two and with a limited selection. Or perhaps you want to order directly from Shinzi Katoh’s Japan online shop; prices vary according to design. Here’s a guide for English-speakers to navigate the site. Shinzi Katoh’s UK website also does international orders (currently 25% off lunchboxes): lunch totes are £18, single-tier boxes on sale at £7.50, double-tier ones – £8.65. Don’t forget: if ordering lunchboxes, do check the size as the double-tier ones come in 460ml and 540ml. 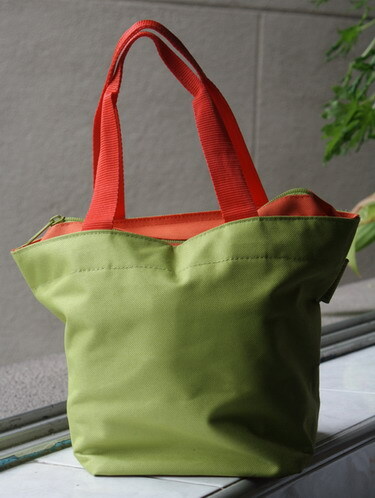 If the lunch bags are too small for you, another option could be the short tote bags which are the same height but twice the length of the lunch bags (W315×H160×D110mm). N.B. : I haven’t purchased from any of these shops myself so no comments on the actual level of service. I’ll just keep wishing hard for my Christmas this year… or next. Quite often I carry food for more than one meal and it’s a real hassle to get to the largest box (usually the main meal, lunch) at the bottom of the bag. Sometimes this involves unloading everything on top first, and going through the same process all over again to put the box back in! After struggling with this a few times, I realised how much the two-layer bag from Tzu Chi Foundation would help me. Earlier, I wrote about the range of 便當 biangdang /bento equipment from this Taiwanese Buddhist organisation, which promotes concern for the environment. I’m a huge fan of their folding chopsticks. This bag fits a rectangular lunchbox in the bottom zippered layer, the precise size of my Asvel box. I usually squeeze my plastic cutlery or folding chopsticks into this section too. In the upper compartment, I’ll put my fruit box, tea time snacks and oshibori. There is also a small zipper pocket inside the upper layer – just nice for paper napkins but I have given those up in favour of the more environmentally-friendly oshibori. Sometimes I slip in a teabag if there’s going to be hot water at my lunch destination. Once I put in all these, there’s no space for my 300ml insulated mug though, unlike with my Muji and Reisenthel bags. Unfortunately, Tzu Chi in Singapore has moved from a convenient downtown location in Chinatown to Pasir Ris. So it’s worthwhile to call ahead and ask if they have stock. They were out when I wanted to buy this bag about six months ago, and I ended up getting a friend to buy it in Taiwan for me, where it cost about S$10. My other bento bags: cream-coloured Muji and green & orange Reisenthel. The German brand, Reisenthel, is mostly known for its folding, environmentally-friendly shopping bags. Whilst browsing the colourful designs at Tangs one day, I chanced upon these small tote bags intended for young children – going by the photographs on the tags. However, they are a perfect size for bento too. I can’t seem to find this bag on the official Reisenthel website though. Tangs had them in three colours: kiwi green with orange trimming, sky blue with lime trimming, and if I remember correctly also pink with sky blue trimming. The price was S$12.95. 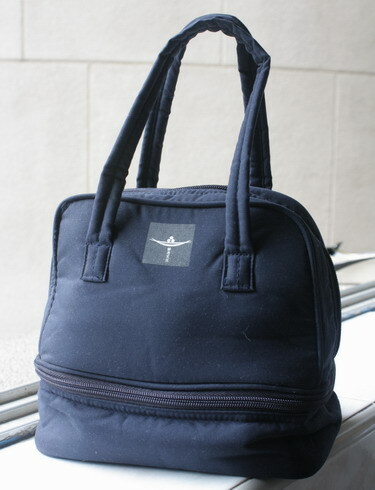 Features I like are the zip closure, the zippered inner side pocket, and the square base, which makes this ideal for square bento boxes that don’t fit so well into my Muji and Tzu Chi bags which are designed for rectangular boxes. This is big enough to hold a lunch box, extra boxes for fruit, teatime snack, cutlery, oshibori as well as my 300ml insulated mug. My other bento bags: cream-coloured Muji and double-layered Tzu Chi.